Goldcoast Ballroom & Event Center | NEW!! - Hustle!! 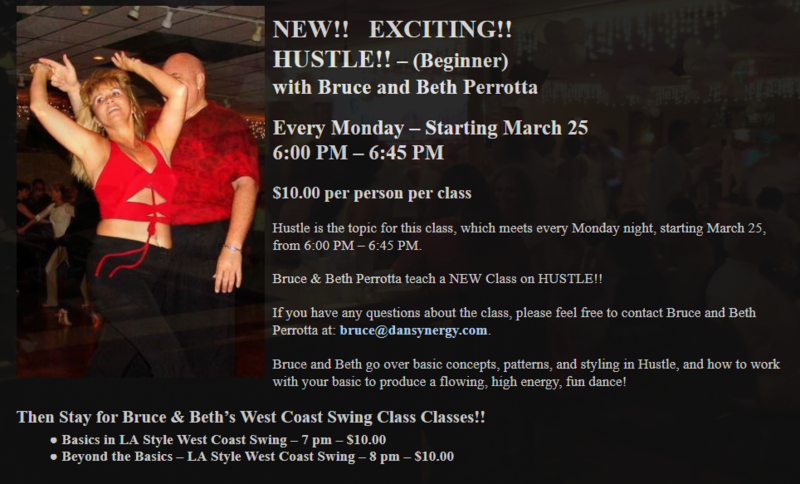 - (Beginner) - Every Monday - 6 - 6:45 pm - with Bruce & Beth Perrotta!! -- Then Stay for West Coast Swing Classes with Bruce & Beth (7pm Basics - 8pm Int/ Adv)!! NEW!! - Hustle!! - (Beginner) - Every Monday - 6 - 6:45 pm - with Bruce & Beth Perrotta!! -- Then Stay for West Coast Swing Classes with Bruce & Beth (7pm Basics - 8pm Int/ Adv)!! « Argentine Tango Classes – Every Friday (7 PM – 8 PM) – with Jean Claude Babiloni & Robin Ren!! – COMPLIMENTARY WITH PAID ADMISSION TO EVENING SOCIAL DANCE! !